1. ChiIL Mama--What's your first name? 2. CM--How far did you drive to see Rock of Ages? M--I took the train from Galesburg -- so roughly 200 miles. 3. CM--Did you come in costume? M--No, but I wish I had! D--I dressed up, which is like a costume for me, but no. 4. What are some memorable audience outfits you saw? M--There was this group of women as we came in that had neon-colored glitter wigs and boas. That was my favorite. We also saw a lot of leg warmers and Flashdance-style tops. And then there was the bachelorette party with the bride in a tiara. 5. 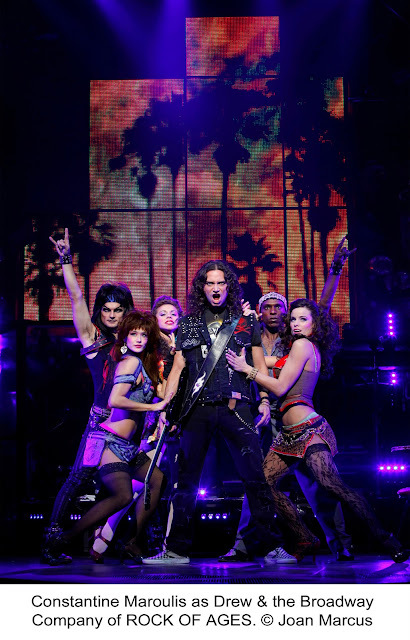 What was the major draw, or your main reason for coming to Rock of Ages? M--I'm not going to lie. The primary reason I wanted to see the show was Constantine. I'm an American Idol fan. I had also read reviews of the show when it was on Broadway and it sounded like such a fun show. 6. Tell me about your favorite scenes? M--I absolutely loved just about any scene with Lonny. His character was hilarious! I thought the bathroom seduction scene was really well done and loved the act I finale. D--Sister Christian scene - love that song! And Whitesnake Here I Go Again scene - I liked the power beats as much now as I did then. 7. Who's performances stood out and why? M--Constantine for sure, but I also loved the actor who played Lonny and the actor who played Stacy Jax. D--Constantine - seemed like a shy nerd type, which doesn't really match the hair and Lonny who rocked that mullet hard. And if that German character wasn't gay, his actor certainly was. K--I liked the club owner because he had the funniest lines. 8. What are your backgrounds or professions? M--I am a high school English, speech, and drama teacher. I also act and direct with local community theatre. D--Regular working stiff now but I've had theatre design experience and I really enjoyed the set and how it functioned (swing-out bathroom/producer office) as well as how it was dressed. 9. 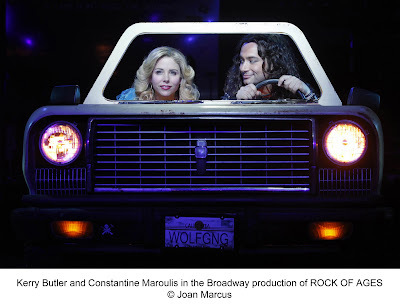 Those of you who come from a musical background, what is your take on Rock of Ages vocally and theatrically? M--No music background -- just a music lover. I do direct musicals, though, and was just in awe of the technical prowess of the show. D--Minimal musical background (high school choir) but I thought the voices were very strong and, for the most part, they honored the songs by not changing them to be The-at-trick-cal. 10. Give me a 1 sentence sound bite. D--Half of me enjoyed the show while the other half of me enjoyed a few trips down memory lane - that was worth the price. 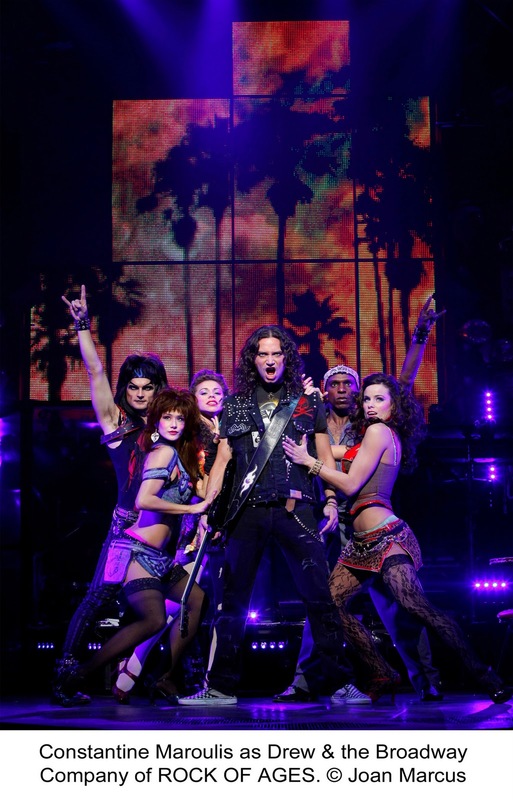 K--"Rock of Ages" is hot, sticky, and sweet. 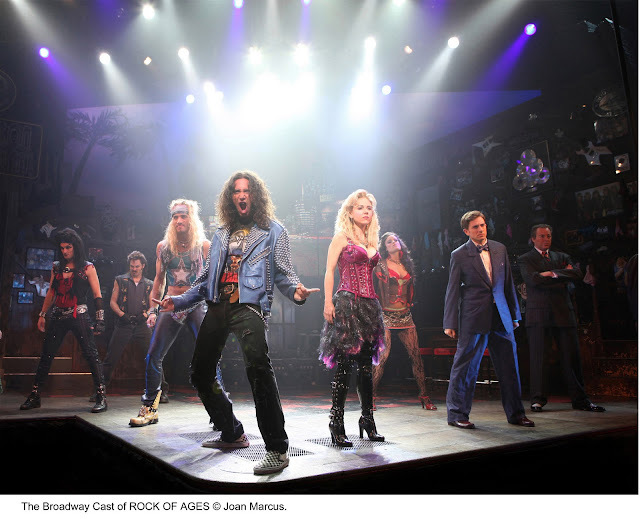 Get your Rock of Ages tickets today at Broadway in Chicago.